The regional banks Oberbank and BTV achieved a rise in profit in the first quarter of 2012. BKS recorded stable results. In the first quarter of 2012, Oberbank could strengthen its profitability. 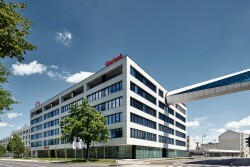 EBIT as well as profits were up substantially, CEO Franz Gasselsberger said. The net interest surplus was down by 5.7% to € 77.0m (after € 81.6m). Risk provisions were down by 21.1% to € 19.4m. EBIT rose by 4.1% to € 59.9m. The pre-tax profit soared by 23.0% to € 40.5m.